Maa Sarala Group of Raikala Village was formed on Dt:-13.11.2007. In the initial days, they created savings fund in the group that assisted them to maintain the group. 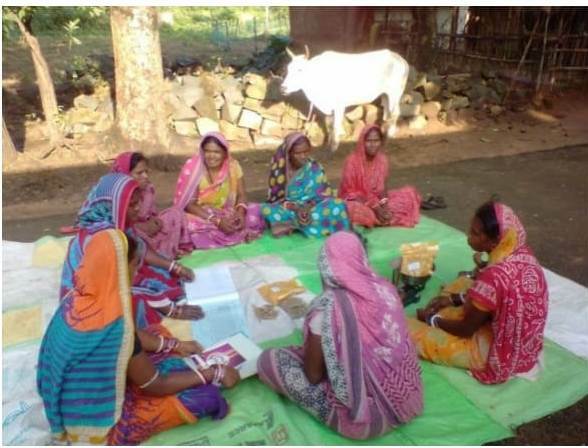 Within the due course of time, their savings increased and the group members took loan from the group fund and returned the principal amount with interest. Gradually, by following the process their savings increased. They take loan for their children’s education, marriage and to meet medical expenses. As a project activity, PECUC decided to support the group to enter into some income generation activity. The group showed their interest in turmeric business. They were supported with turmeric, packaging machine, weight machine and polythene to pack the product and start business. Finally, they started selling the products. Then they were linked with Kendujhari, the shop promoted by ORMAS to sell products of SHGs in the village and local markets. They earned profit Rs 1000/- per month continuously for two years. The Project team facilitated their visit to different food and tribal exhibitions and they participated and sold their products and earned money. Looking at their interest in business, PECUC staffs decided to link them with MID day meal to supply their product. The group members along with project staffs visited the office of the Block Education Officer and interacted with him. The officials were convinced and asked them to supply 1 kg to one school only. After three months, the group received order to supply 30 kg of turmeric to Block Education Officer which shall be used during preparation of mid day meal. Now they not only are recognized at village level but also at block level. There business increased day by day, making their economic conditions better. Apart from this, they are also doing kitchen gardening in the backyard of their houses, with additional IGA selling spices. The group members besides economic activity are also motivating children to continue their education. In addition, they have been crusaders in fighting against exploitation, abuse and violence, preventing child marriage in the village and taking initiatives to address child labour issues in the village. They are now participating fearlessly in the Gramsabha and Pallisabha and are stating their grievances as well presenting suggestions, and are heard by Panchayat even.